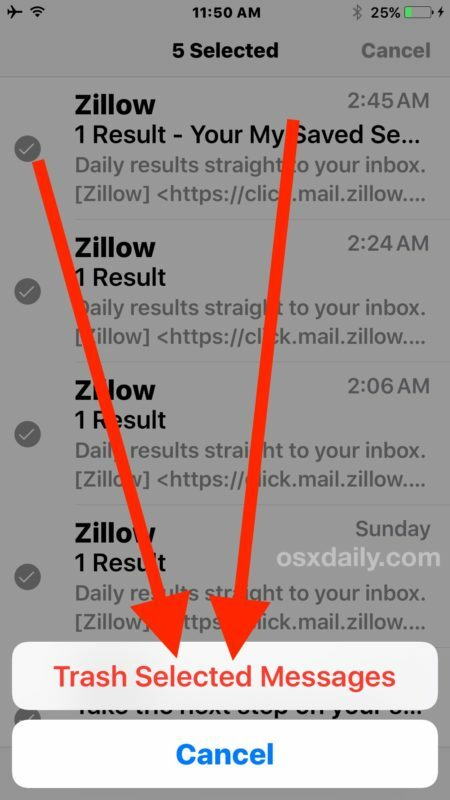 If you have updated to iOS 10 you may have noticed that the Mail app “Trash All” option is missing on the iPhone and iPad. This is unfortunate because the ability to delete all email in iOS is easily one of the more useful features to managing a busy email inbox. 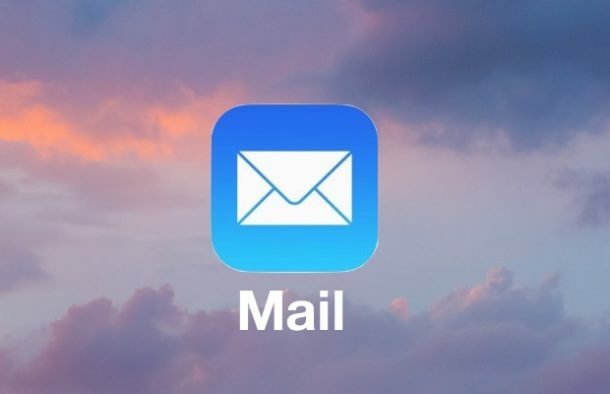 The lack of a “Delete All” button in Mail for iOS 10.0, iOS 10.0.1, and iOS 10.0.2 could just be a bug or mishap, but in the meantime if you’re looking to regain that trash all functionality we’ll show you a workaround that accomplishes a similar “Delete All” mail ability. 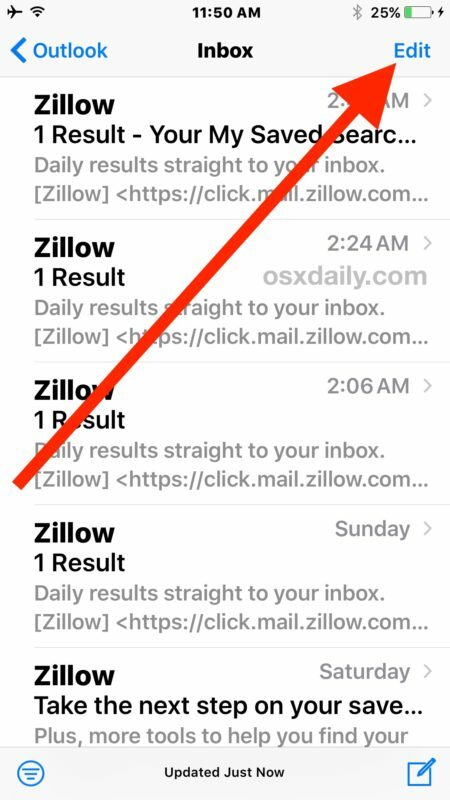 By the way, it’s not just “Trash All” that is missing in iOS 10 Mail, it’s also any ability to bulk select all emails in general. For now the workaround involves a lot of tapping and manually selecting emails and then trashing them, it’s a bit cumbersome but it gets the job done on iPhone and iPad. Quite a bit more hands on than before, but it works the same. Losing a feature is rather unusual with an iOS software update, which suggests the removal of Trash All in Mail may be inadvertent. It remains to be seen if future releases of iOS 10.x will regain the ability, but hopefully we’ll regain the same ability to delete all emails on iPhone and iPad that existed in prior iOS software releases before 10.0. Another workaround allows deleting all emails in iOS 10 as well, but it should be stressed this is indeed a workaround and it is nonspecific in that literally every single email will be deleted from the iPhone or iPad in the process. This is an old workaround to delete every single email from Mail from long ago that continues to work with iOS 10 on iPhone and iPad. It is unforgiving and literally deletes every email from every account on the iPhone so be certain you wish to do that. Know of another way to delete all email in iOS 10 on an iPhone or iPad? Let us know in the comments. The option to delete email from lock screen notifications has also gone.. 🤔 Not appreciated. Mail management on the lock screen is a mess. The new lock screen is a disaster, I hate it. It reveals tons of personal information without even entering a passcode. This makes me want to dump Apple; can’t believe they took the feature away – WHAT IS GOING ON WITH APPLE?? I’m ready to lose my mind with the unlock function having to press and double press to put my password in. I’ve always hated the iphone for not letting you delete all on messages and finally get it as a feature and have to deal with it going away. I have over 6000 messages I don’t have the time to clean up one by one and the banner now which was easy to read above my apps now covers whatever I’m doing and is constantly getting in my way and the notifications center shows all my personal information. I wish I never upgraded. All you have to do is go into settings > general >accessibility > home button > then toggle the option for “rest finger to open” to on. This will let the phone unlock the way it used to be with just your finger print and no click. Recently updated to OS10 to my regret. Each update is worse than its predecessor. Doesn’t Apple have a human testing these things in real time instead of computers and algorithms? Anyway, my home button setting does not have a ‘rest finger to open’ setting. Someone on the Apple site wrote the following and while it’s cumbersome, it worked for me. “Go to your inbox, Tap Edit, then Mark All, and then Mark All as Read. This will then close the Edit mode. Tap Edit again, and tap the top message in the inbox. Press and hold the Move button with your thumb. That is what we had to do before, shame we are going backwards. This method works and is still much quicker than having to check every message, especially if we are talking about a lot of messages. I wish they could make the process as easy as it is on Mac OS. Have been trying to mass delete 2,000 emails for 2 weeks and finally found your post. Again, works great. Thanks. Thanks for posting this! I’m newer to Apple and didn’t know about this trick. Worked great though I am very disappointed that the Delete All function is gone. Bring it back!! THANK YOU! This is the best workaround that I’ve seen. I was so upset to lose the Trash All functionality because that’s been the only way I can manage the hundreds of emails I get daily. Clicking on each email individually and sending to Trash was not a viable option so this workaround that you’ve mentioned is the most reasonable one I can find. Thanks again! That there needs to be a multi-step workaround to do the same things as a single button press in the previous is evidence of bad design. Jobs is probably rolling over in his grave. OMG! Can’t they went backwards. Thank you SO much for this info. Saves so much time over having to to mark the 100s of emails I get a day. Thank you Vivian. These megalomaniacal companies expect people like you to fix their problems without reimbursement. They suggest that it’s about letting the public join in on their development and make the world a better place, ‘We listen to you.’ especially when it helps fix their shoddy work. Thanks again. Thanks! That worked for me. I hope they put the “Move all” button back in the next bug fix update. Vivian, thank you for sharing this information. I had over 800 emails. Now everyone in the trash. Thanks Vivian! That worked for me. I would rather do this little dance than repeatedly select emails. Thanks for the tip. But what a pain. I have my security cameras on their own email for movement notifications. I can get a thousand a day. I don’t get the loss of a useful Trash All function. Thank you lots – I just did this and it worked – but an hour later all the emails I had deleted from my inbox – and it had said it was empty – had come back again – all 12000 of them. Thank you for sharing your knowledge so generously – do you have any more advice. My phone storage is getting full with 2GB of emails I don’t want and can’t get rid of! Thank you Vivian! This was an awesome fix… 10,000 emails g-o-n-e, just like that! I didn’t see a Trash icon- just Inbox…until I’d manually deleted one email. then the Trash icon appeared. Yup, me too. I suspect they noticed this workaround and removed it in one of the updates. Looks like Apple REALY does not want to have a delete all function. Maybe they had some sort of problem – unhappy users losing everything, etc? It works but when I reboot the app all my mail is back. I’ve done this 5-6 times, shutting down the iphone and reloading the app. Help? No delete all feature in Mail now? And no slide to unlock? And the terrible Messages mess? I guess I don’t understand iOS 10 or macOS Sierra. They both removed a ton of features and added a ton of problems. What is the point of these updates? I wish I had never updated, I do not want to regress when I update software. That makes no sense at all. I’ve been wondering that for a while now; I’m still on iOS 6. I only updated because I got tired of always getting those annoying pop ups every time I signed in. How have you dealt with those if you are still on 6? This is one that baffles me. I understand Apple changes stuff, but it took them until iOS 9 to introduce that, despite having it on an Android phone for a long time, then they got rid of it. I’d like to strangle the person who thought they should get rid of that feature. The also eliminated the ability to order items in the Notification Center by app. Now it’s only time-based. Bit regression as far as I’m concerned. Doesn’t OSXDaily have some pull with Apple on these????? FYI, today is 10/24/2016, time is 1:20pm. I just spoke with Apple rep and he informed me that the “Delete All” feature is no longer offered…period! I’m about ready to learn a new system and dump Apple, both phone and iPad! The rep’s advise is to go to the Apple site and submit a comment. He said that is how the “Delete All” feature was added in the first place. I keep getting repeats of deleted mail coming back into my inbox on my iPhone. How do I stop this? I used the “new”method and inadvertently deleted 200+ emails that I cannot retrieve a very serious mistake for me, any thoughts on retrieval would be welcome. Try using Shake to Undo, literally shake the phone to see if you can undo the delete action. Otherwise look in the “Trash” mailbox folder and see if they are in there. Its crap like this that makes me question why I keep going with apple. My wife’s phone is not a trendy iPhone, costs less, and has more better/useful features. These instructions for older iOS version work….. I have seen an option on another phone to remove yourself directly from a subscription based email, but do not have that option on mine. Any thoughts? How can you delete message that keep coming back saying they cannot be moved to the trash in iOS 10? School boy programming mistake in dropping ‘delete all’. When I delete all of my emails as suggested by Vivian, it appears to work, but then the next time I open my mailbox, all of the emails are still there! This is so freaking annoying, why can’t Apple fix this issue?!?! When I delete all of my emails as suggested by Vivian, it appears to work, but then the next time I open my mailbox, all of the emails are still there! This is so freaking annoying, why can’t Apple fix this issue?!?! I have over 6000 emails! It has long been a problem for users to delete multiple inbox mail messages–not a minor issue considering the amount of junk we receive. To select hundreds or thousands of messages for deletion one at a time is cruel and unusual punishment!! The prior Apple solution was to “select all” messages you want to delete and move them to your Trash bin. It seemed to work–at least until the messages came back. With IOS 9, Apple added a single button to trash all messages, providing a ray of hope. While the button removed all messages, once again they eventually came back. Now, with IOS 10, Apple has removed any ability to move or delete multiple messages, indicating that the fix didn’t work. That is curious since we can delete all messages in Trash with one click and they are gone for good. What bugs me is that Apple says it removed the functionality to protect us from accidentally removing messages instead of admitting it didn’t work. Until it’s fixed in an update, I’ve switched to Microsoft’s Outlook email app for iOS, where you *can* select all to Delete. I have removed purged mail on server. Wonder if deleting account and resetting up would work? Yes, it would. If you delete the account, it will delete all the email. When you set it up again, it will go to the server to download your email, but if you have purged them from the server, it will have nothing to download. Then the trick is to delete mail daily so it doesn’t pile up again! (I’m still working on that one, having limited success) I could kill Apple for eliminating the trash all function, if they don’t bring it back soon, I swear I’m selling my iPhone and iPad and going Android. Apple must be losing it. My edit button is now a done button so I can’t use this workaround. Suggestions to get the edit button back?? Laura, follow the instructions. The “Edit” button turns into the “Done” button after you select emails to delete. It is how you complete the action. Tap on Done. Then start over. The ability to trash all was only added a short while ago. Bit now its gone, once again. @#$%! I have hundreds to delete each day! This is impossible! C’mon Apple; don’t get so caught up in big splashy changes that you forget the small but important things that people want to keep and will actually use. And if I don’t want to update don’t nag me incessantly. My poor old 5s doesn’t want to be something that it’s not. Of course, making it easy for someone to keep using their old phone is not consistent with your monetary goals. Well, paying a ridiculous amount of money every couple of years for your latest offering is not consistent with mine. So upset you took away trash all, what are you thinking? Also, don’t like all the pot ups before I unlock my screen and harder to open with my thumb print, if I don’t do it just right I get Seri. Make our phones easier not harder! Not only that you updated my phone without my approval, but you took features away that were very useful!! Whoever made that decision must not use their phone for e-mails !!! Precisely, Jim. I have made it a point to not plug my iPad in at night so it would not update, until I knew whether I would like the newest IOS or not. I do NOT like, in fact, I HATE IT. So I absent-mindedly plugged it in the other night and guess what? That’s something else we need to raise a raucus over – APPLE SHOULD NOT HAVE THE RIGHT TO FORCE UP TO UPDATE!! These are OUR iPhones and iPads that WE paid big bucks for and WE are entitled to our privacy and to say “yea” or “nay” as to what goes into and out of them. I just purchased my first smart phone, an iPhone 7. When I clicked “mail”, all 26,000+ emails I’ve ever received were loaded to my phone without any option (that i could find) to select a date or to say “only new emails.” Since I already have copies on my MacBook Pro, I don’t need them on my phone. I will try to do the acrobatic finger strokes described to move them to the trash, but it sounds cumbersome. Not the simple Apple design I was expecting, especially after using Apple products at home and work for many years. So my iPhone is full and I’m desperate to open up space, and I can no longer off-load photos to my old iOS 10.6.8 computers. So, on my recently updated iPhone 5s, I mass deleted about 10,000 emails from inbox using the “hold finger on Move while tapping the selected messages, then the window showing those 10,000 emails appears, with options below. I hit “Delete Messages”, then went back to Mailboxes, selected All Trash, hit Delete All. Now I am in trouble. My account still shows 10,000 emails in the Mailboxes window, but when I hit that account, the iPhone shows that account as No Mail. Also, the All Trash number of emails, in Mailboxes, jumps around from 5,000, to 1400, etc. . I hit Delete All, after selecting All Trash, and it takes a while for the 1400, or whatever the amount at the time, to disappear. My inbox is still at 10,000, the Trash is at zero. Wonder if my iPhone 5s is gagging on too many emails trashed at same time? All comments and help welcome! One by one takes too long I can’t believe they screwed that up. Emails are annoying at best now phone is overloaded with them. Fix it Apple please. For the love of god I hope they put this back. I use it ALL THE TIME and it’s the first thing I noticed after the update. Whatever idiot thought it was a good idea to take away the select all / move to trash option should be fired immediately! Idiotic manager or a business reason to force upgrade to higher GB Iphone7 and or use iCloud subscription. Oh and just to add, iTunes has become a laughing stock joke also. I remember a glorious time in Silicon Valley during the late 80’s and 90’s where ideas where a plenty and some even made it to production. But if what you made was not well received by both the industry and public, independent magazine writers and publishers would be ringing your phone of the hook. I respected those writers as they where techno junkies and they where blunt if the product was a flop or generally useless and haphazard but if it was good then they where your most vocal champion. Not so much anymore. I can only think of one logical reason for removing the delete all button. I shared my thoughts with Tyler Durden and he agreed. 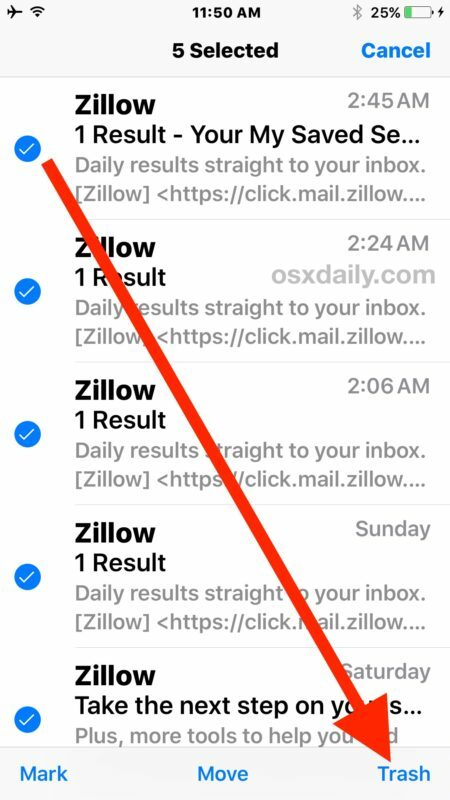 deleting multiple emails was one of the best features of the mail app…why this is gone is mind boggling. Dumbest thing I’ve read all day! No mention of whether they fixed this issue in 10.2. Until they do, I refuse to update my iOS from 9.3.1. No reason to lose functionality that I DEPEND on. I actually thought the workaround was a joke – individually select the emails!?!?! That’s what we have been doing, and why we wanted a “Trash All” feature. Jeez!! I have done the workaround MULTIPLE times and all of my mail continues to show up in my inbox. That is 9,000+ of emails that will NOT GO AWAY. I have tried deleting them immediately after trashing them over and over and they still show up. What am I doing wrong??? I found another workaround. You need two mail accounts. I have a primary account where I receive all my mail. I have a second delete account. To dump your mail, do the old move mail trick but move all the mail to the All Trash folder (which you need to enable). Then go to the All Trash folder and select Delete All. Gone. Hope this helps. Move to the All Trash folder that appears in the delete account. When I did the work around, it did work, but it deleted all the message from the server as well. I’m going to look at the settings to see if I can fix this. Fortunately, they’re still in the trash file when I access the email account on my computer. Great tip & it worked but a few minutes later all the deleted emails returned to the inbox. I don’t get it. I have been trying to delete about 12,000 emails & can’t unless I would do one at a time….no no no. What can you suggest or advise that causes this? First I want to say, thank you to this website for helping us out with something that should be straight forward but its not… thanks to ios10. Secondly, Apple WTH??? Why would you do this? Arent you trying to simplify things, my elderly mother got your phone after I recommended it to her for ease of use, but this is a joke. Please fix this as its really frustrating to do something which should be one command. If this is how youre trying to be important, then youve failed. As like many others if you I am not thrilled with the mail on IOS. However there is a way. Go into settings, mail, accounts. Once you get into accounts, select the account that has the emails you want to delete. Delete the account. Next, add the account back into your mail. After you do this exit settings, go to mail, and look in your mailbox that is linked to the email you just deleted and added back on. Your mailbox should be empty. I have tried these various work arounds for more than two weeks, and the emails just keep on returning. So none of the methods work on my older phone with the new IOS. I have tried Alex’s “new way to delete emails” twice now on my accounts this evening but the emails than increased so that now I have 20,044 emails and the phone screen keeps freezing up. Help! What’s probably happening is that each time you try this unsuccessfully you end up with the old emails coming back into your account again. See my comment below. See my recent comment for an option. I use a certain email address to put in when I fear it will subject me to a lot of junk emails. I used to be able to delete them in bulk and was disappointed when this feature was deleted, leading to thousands of emails stored because I look at it quickly daily but don’t usually take the time to delete the unwanted ones, which are 99.9% of them. I found another way to handle it: On my iPhone, I simply deleted the relevant email account (Settings:Mail), which deletes all the messages in that account. Then I make sure all those emails have also been deleted from the email server. Then I can add the account back again and that mailbox is empty. Voila! I think Apple removed the “delete all” feature on purpose just to sell more icloud storage subscriptions. If you can’t get rid of your emails then you have to subscribe to more icloud storage in order to function! If I didn’t have so much invested in IOS technology, I’d dump the system. I’m certainly looking for an alternative now. This is a gross error in my humble opinion. I used the workaround and the inbox is empty. But my iphone 5s still says 20412 messages in inbox though nothing is there. How do I reset the counter? Thank you very much. Your entry was perfect. Only messages from the CURRENT inbox are deleted. I have over 17,000 emails and ffs they’re all junk! I don’t have time to wipe that all off of my phone! I’m young, none of my emails are actually useful or important and I’d like to just wipe them all at once but apparently I can’t do that smh. My iPhone doesn’t give me the option to delete all messages at once. I go to the mail app then edit, try to mark all but only “flags” and “unread” come up. We all run iOS9 so we have batch delete at our company. Our tech services department said we are close to moving to Samsung/Android. They set up our phones and the couple of approved wifi servers to block the 3x daily reminders to update to iOS10 so nice not to see that annoying update reminder. Apple has truly lost their way since Steve passed.